In order to access global configuration, go to menu MANAdev -> Global Configuration -> Representing Products in Magento Admin Panel. Show Represented Product SKU in Product List allows to show or hide representing product information in Magento Admin Panel. 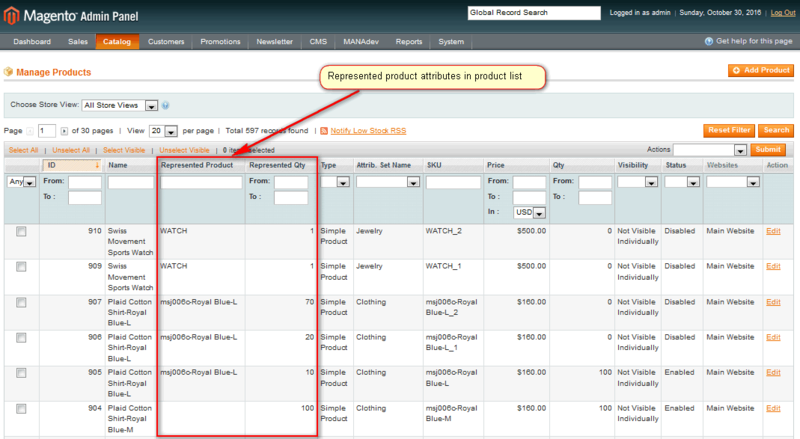 Yes - adds Represented Product and Represented Qty columns to catalog product list in Admin Panel. No - hides representing product columns in catalog product list in Admin Panel. Status - initial product status of cloned products. SKU Suffix - SKU of cloned products is SKU of represented product with added SKU suffix (this field) and some unique number. For example, if SKU Suffix is set to _ and original product SKU is WATCH, then new cloned product SKU will be set to WATCH_1. This vale later can be changed in cloned product edit screen. Override Existing Product Attributes. Used only for existing products being added as represented product. The value later can be changed in product edit screen. Initial values of Representing Products which are added to product. Pack Qty - quantity of product in the package, for example 6 bottles in the pack. Helps to organize storing and selling of packed products. Parts - initial number of parts. The value is used to calculate and distribute original product quantity to all represented products. Unit Of Measure - default unit of measure used for calculation of estimated quantity of represented product. Position - priority of getting quantity for the product. In case total required estimated quantity is greater then physical total quantity, products with higher position gets quantity first. During cloning process of represented product attributes specified below are not copied from represented product. Instead, default values are assigned. Attribute - select any attribute which should not be copied to new product. If you agree to override existing product attributes while adding it as representing product attributes specified below are not copied from represented product. Instead, existing values are preserved. Attribute - select any attribute which should not be overridden while adding existing product. Columns specified below appear in table of representing products as a quick editing feature. Please note that this list of columns may vary from store to store. When no store specified on product editing page, the only columns shown are those specified under Default Config scope on this page. When specific store is specified on product editing page, representing product list includes columns specified under that store scope on this page. Attribute - select any attribute which should be visible in representing product list. Used to synchronize represented product inventory quantity, if external system updates original product quantity. Anytime inventory quantity is modified it takes a note about it in change log table. There is a cron job which checks change log table and makes appropriate updates. Cron Expression - Specifies how often inventory change log should be processed. If empty, scheduled process will not run. Must be in form m h D M W, for example 0 5 * * *. W - day of week. Each abbreviation can contain number, series of numbers separated by comma, or asterisk (*) for any value. Process Now - button to start synchronizing represented product quantities manually. Used to perform full recalculation of represented product inventory quantity, if external system updates original product quantity. Cron Expression - If empty, scheduled process will not run. Must be in form m h D M W, for example 0 5 * * *.